The winning Mallow side show off the trophy at Antequera Golf. Picture via Mallow GC. Mallow's Fred Daly Trophy team romped to a clearcut 6-0 win over All Ireland champions Belvoir Park in the final of the Junior Inter-Club Home International Trophy at Antequera Golf in Spain. The Munster champions of Greg Barrett, Liam Dowling, Eoin Goggin, Kevin O’Keeffe, Kieran O’Sullivan, Conor Roche, Edward Walsh and Roy Whelan proved too strong for their Ulster counterparts at the Malaga resort, winning all their matches inside the distance. Despite losing to 3.5 - 4.5 to Scotland's Turnhouse in the first round, Mallow beat England's Wrag Barn 4.5 - 1.5 and Aberdare of Wales 5-1 to set up a clash with Belvoir Park in the decider. The Belfast club battled in the final but Mallow proved too strong in the end. Liam Dowling bt Ryan Lavery 4/3. 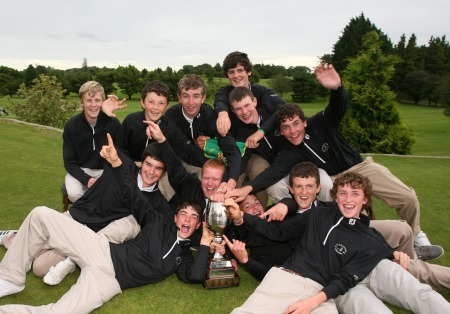 Fred Daly holders Kilkenny and Ulster champions Tandragee will be bidding to follow in the footsteps of Mallow and Galway Golf Club by completing a hattrick of Irish wins in the Junior Inter-Club Home International Trophy at Antequera Golf Club in Spain next week.